It is that time of year again, the time we all get onto Google and type in the words gift guide for _________ (fill in the blank for whichever friend or family member you are looking for). If you are like me, anyone you have asked what they want doesn’t have anything to tell you this year. Which means we are on our own to put some thought into the gifts we give and select something perfect for the person we are gifting to. Here are some ideas for a few of the types of people I search for most often. We begin with the design lover. 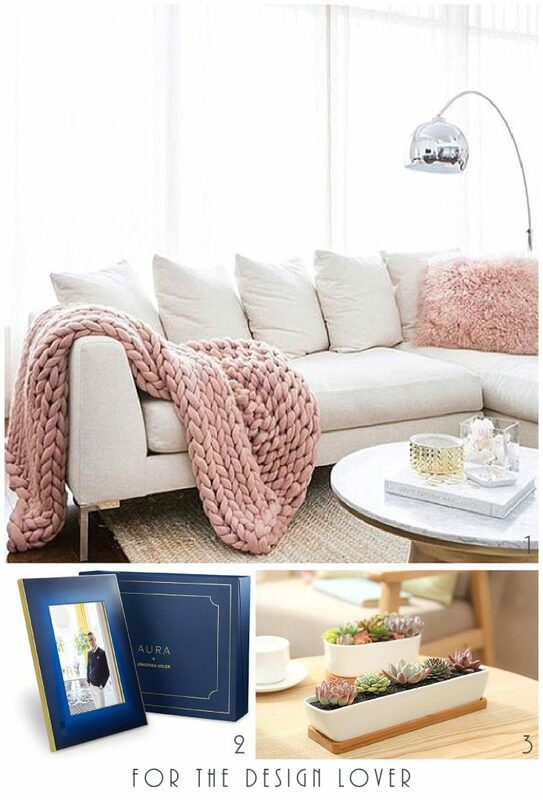 Nothing is greater than a cozy and chunky knit blanket. I love this one found on Etsy from CosenzaStore. For those who love tech and great style, gift them the Jonathan Adler addition of Aura Frames. A great digital frame to display all your photos from the past year. Read more about tech for your home here. No home is complete without some plants. I am loving these modern and stylish planters. We could all use some more plants in our home. These were also found on Etsy from JasmineSupply. Next is for those people who love color, many of my design loving friends and family would fall into this category as well. I am in love with the bracelet made of colored pencils! Be sure to check out the Carbickova Etsy store for all the other jewelry as well. It really is fantastic. Add a splash of color to your everyday wardrobe by wearing a necklace from the Etsy store BoldB. Who says grey skies mean we don’t have any color? Add some color to a gloomy day with this Color Wheel Stick Umbrella from Uncommon Goods. Add some color to the world with these perennial wildflower seeds that attract bees, butterflies, and hummingbirds from Terrain. 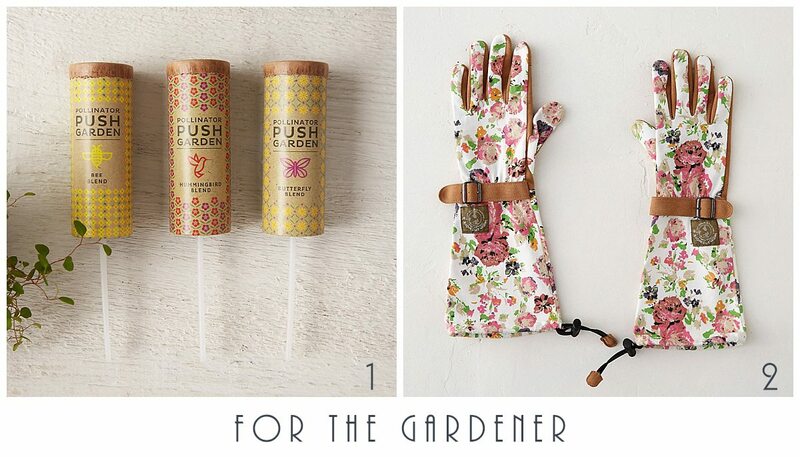 I love pattern and if I gardened more I would certainly want to wear these stylish Floral Twill Garden Gloves from Terrain. For those who prefer the indoors (and some design and tech) we found a few fun games to pass the time. This 1,000 Colors Puzzle from The Colossal Shop will definitely challenge even the best at puzzles. If you love games and Typography then this Scrabble Typography set from The Colossal Shop is for you. For those who loves games, but don’t want to put down that phone, you are in luck. Now you can do both while playing Game of Phones from Uncommon Goods. 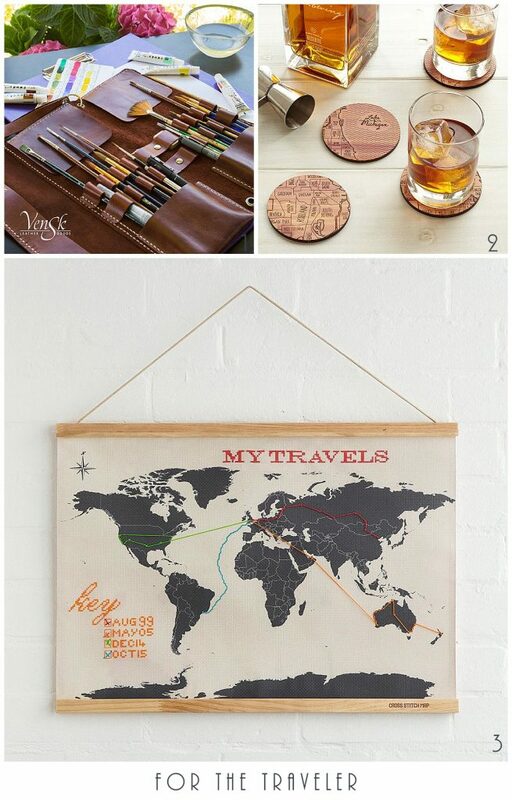 For the friends and family who love to travel (I know we love to) here are a few gift to help them travel, remind them of their travels, or maybe even remind them of home if they are not there that often. For the artist who travels, they need something nice to carry brushes, or pens and pencils in. I love this leather case from VenskLeather on Etsy that rolls up and safely stores all your brushes from harm while on the go. Remind someone of their favorite city, or may of home if they don’t get to spend much time there with these Neighborwoods Map Coasters from Uncommon Goods. Record where you have traveled on this Wanderlust Cross Stitch Map, add to it as you travel to more destinations. Lastly, you cannot forget a gift for the Hostess. Most of us have at least one holiday party to attend and it is nice to show up with a little something for whoever happens to be throwing it. I am in love with this Carved Teak Serving Board, gift this and I am sure you will see some appetizers displayed proudly on it at the next party you attend. 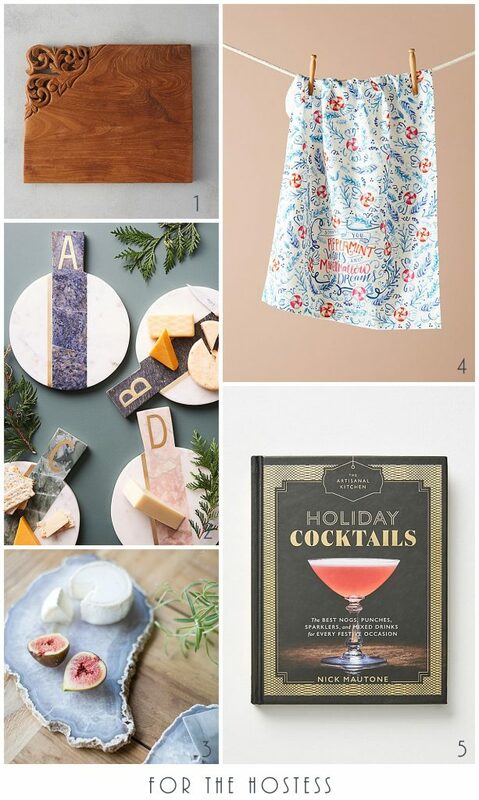 If your host/hostess is more of a marble fan then look no further than these Marbled Monogram Cheese Boards from Anthropologie. Or maybe you want to be a little more glam with your serving board gift. Then go for the Agate Slice Serving Board from Terrain. If you want a little bit of the holiday theme included with your gift look no further than the Peppermint Wishes Dish Towel from Anthropologie. This was a collaboration with one of my favorite artists Valerie Mckeehan. Lastly, you can never go wrong with a good book. I love this Holiday Cocktails book. It can even be used right away at the holiday party.